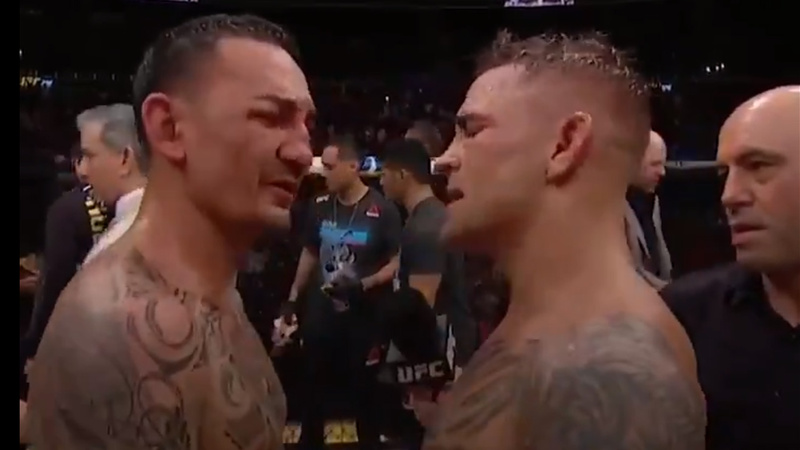 Current featherweight champion Max Holloway may have lost the interim title at UFC 236 last night (Sat., April 13, 2019) but he fought like a warrior against Dustin Poirier. Poirier threw a hammer on ‘Blessed’ early in the fight and continue to batter him throughout five hard-fought and bloodier rounds. At the end judges awarded ‘Diamond’ with unanimous decision (49-46 x3) win. That loss snapped Max Holloway’s 13 fight winning streak. Now UFC president Dana White wants ‘Blessed’ to go back to 145-pound so he can defend his belt, I guess against Frankie Edgar whom Max haven’t beaten yet. Holloway took to Twitter earlier today and issues statement on his loss. Regardless of his loss, Holloway showed courage to step up one division higher than his, however, his frame appeared smaller, but he put on quite a show last night. Following his bout, Holloway was taken to the hospital. ‘Blessed’ seems to be physically and mentally in good spirits and at the moment healing up from the beat up. Max Holloway may be down at the moment, but he’s not out yet. The 27-year old will be back soon and continue to grow his legacy at featherweight following a robust learning experience.